In this photo taken in November and made available Tuesday, a health worker waits to receive a new unconfirmed Ebola patient at an Ebola treatment center in Bunia, Congo. 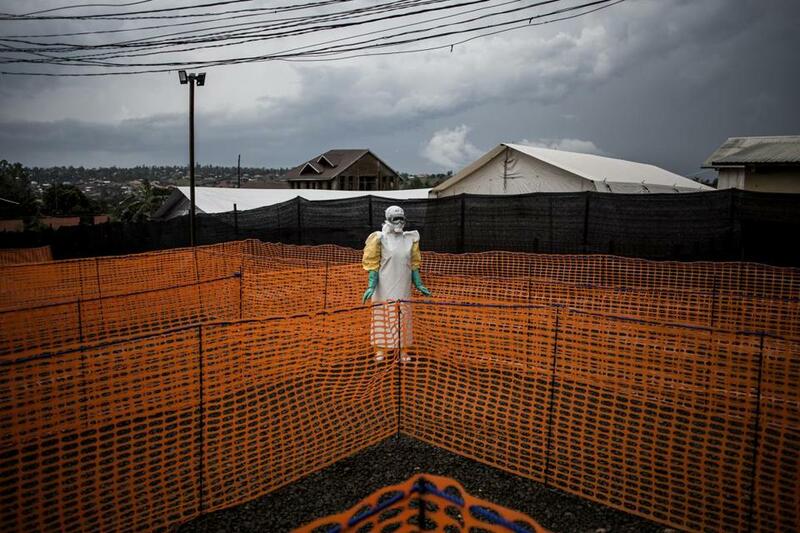 What is it about Ebola that so captivates the Western world? In recent weeks, an epidemic of the infamous hemorrhagic fever virus in the Democratic Republic of the Congo has prompted stories in the world’s most influential news outlets, from the British Broadcasting Company to The New York Times. Now, the war has flared up again; according to the United Nations, more than 4 million people have been displaced. Yet even then, it takes a disease such as Ebola, with pandemic potential, to bring the plight of the Congo to global attention. While the risk of an international outbreak is highly uncertain, wealthy nations’ fear that the disease will spread to their territory — as it did in 2014 — seems to outweigh their concerns for vulnerable Congolese people. As Ebola becomes harder to control, the United Nations is now focusing on bolstering the organization’s peacekeeping forces to contain the rebel violence in the Congo, but primarily because the violence has halted the Ebola response. It’s troubling that it took Ebola, not millions of Congolese deaths, to bring about this international assistance — even if it is now helping the Congo in ways that would probably not have happened if not for Ebola. Even now, most media coverage has focused on Ebola’s potential at spreading internationally, amid what a top World Health Organization described as a “perfect storm” of war, disrupted communications, and social trauma. News stories have focused far less on the damage that the epidemic is inflicting upon African lives — by propagating stigma, aggravating mental health disorders, and challenging cherished cultural norms. Beyond the deaths from the disease, daily existence for many Congolese people has been completely disrupted. Traditional burials, which involve washing the body of the deceased, are no longer permitted for fear of transmitting Ebola further. This alone has led to conflict between families and health workers — which might seem outrageous to Westerners who have never imagined the feeling of not being able to bury our loved ones the way we would want to. The international response to Ebola is not expected to end anytime soon, with World Health Organization officials estimating that it will be at least six months before the epidemic can be ended. We must ask ourselves: Would major human rights conflicts in Yemen, Syria, Venezuela, Palestine, and Myanmar gain daily international coverage if these areas were also suffering from a pandemic-prone disease? Dr. Abraar Karan is a global health physician at the Brigham and Women’s Hospital and Harvard Medical School. The opinions expressed in this article are solely his own. Follow him on Twitter @AbraarKaran.